Quilts and Pieces: "Sew" much Quilting - So Little Time! "Sew" much Quilting - So Little Time! Well, back at work today after my vacation from the quilt retreat and playing baby with the root canal! Actually it wasn't so bad, just kind of fuzzy headed the last 2 days from the pain meds! I "pretended" to work from home yesterday! Anyway, here is a bad picture of my main project I worked on during the retreat. 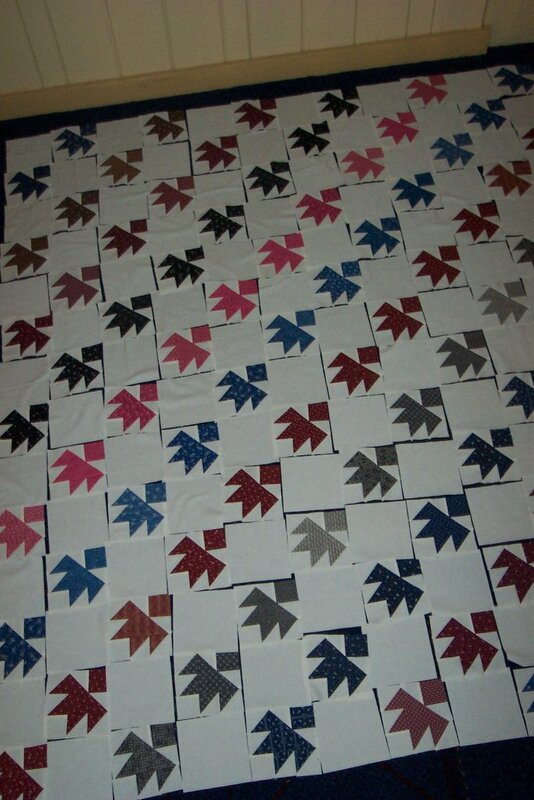 I have most of the blocks in a row sewn together, but no rows put together yet. The only place big enough to lay it out was the hotel hallway and that was so dark I had a hard time getting a good picture. The pattern I got for this quilt was based off of a real antique quilt - which I"ve seen in real life! And it is amazing how much this quilt looks like the real thing! Well except not as faded! I LOVE making quilts that look like the antique one! The name of the pattern is called "Men at Work". Because look at the block - doesn't it look like those little men on the yellow road signs! Actually the block is upside down when it looks like that - but this is how I had it laid out. I thought of putting on "man" upside down from the rest and calling the quilt "$10,000 Fine"! But then I thought I just might offend someone! I'm going to quilt this one simply with straight lines since I want it to look like the antique quilt. And I can do that myself! That's about it for now until I can really catch up - they have me hopping at work today, but I took a few moments to post this for you! I'm anxious to touch base with everyone again! I feel like I"ve been gone forever! Dawn, Of course I absolutely love this one and think that you have done a great job of it! When I first saw it, it reminded me of the little black birds that are swarming over the fields right now, eating the leftover soybeans. Getting ready for their big journey south. When you said it was called men at work, I tipped my head and yep! there they were. It's good to have you back home and posting again. We missed you! *LOL* MEN AT WORK!?? And here I was thinking they looked like big headed birds in flight :c) I love making quilts that look old too....isn't it great? Yep! I totally "saw" your Men at Work right off the bat! Too cute!!! I can't wait to see it quilted. There's lots of tricks to making yours antiquey...so holler...and we'll all holler back if you need! Hope your teeth are behaving for you! Great quilt in progress, Dawn. When you say quilt, you mean handquilt, right? And is that a white-white fabric or more creamy or musliny? Santa is starting to appear! You'll Never Believe what I Found!!!! Oh What a Day it has been! It is getting close to Turkey Time! Congratulations Bonnie!!!!! YOUR FINALLY DONE!